Inspired by an instruction video and watching our grandkids enjoy the water tables at a children's museum (don't you think "museum" is the wrong word for these places?) I decided to build our own portable water table. The most expensive item is the submersible water pump. I bought one from Home Depot for $29. The pump sits on the bottom of the bin and just needs to be covered by water. 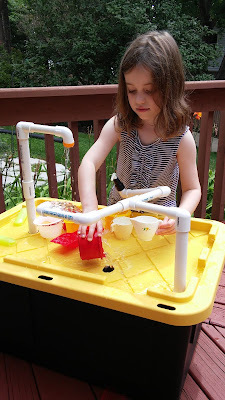 I did notice that typically after 30 minutes of play more water needs to be added. I found the 1/2 inch size pipe was the easiest to use. Leaving the pipe connections not glued allows the "water system" to be configured a variety of ways. Small plastic cups and stoppers add to the fun. 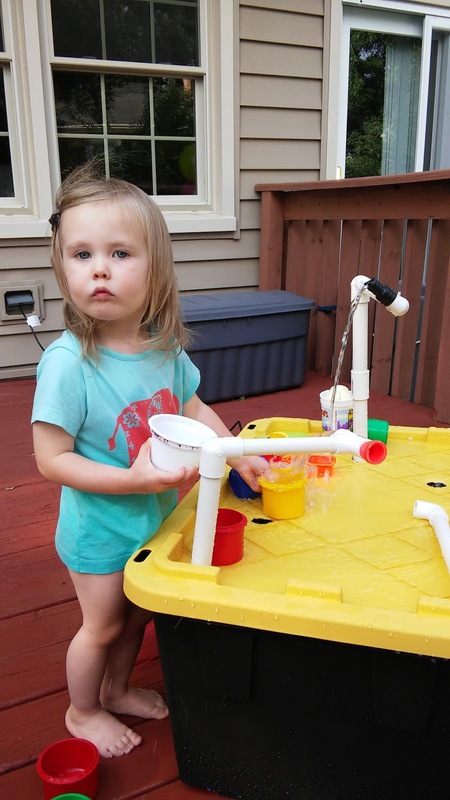 Both water table testers gave it their sign of approval.